Learn how F0 value is determined for sterilization using formula including Z value. Generally, sterilization is done at 121 °C and it is a standard temperature for sterilization. If we want to sterilize the material at the temperature other than 121 °C then we must change the time of sterilization. Some materials are heat sensitive and cannot be sterilized at 121 °C. F0 value is used to determine the exposure time of material for sterilization at a particular temperature. F0 value is the time in minute for the specified temperature that gives the same thermal lethality as at 121 °C in one minute. It explains that temperature is not an important factor in thermal sterilization but lethality is important. 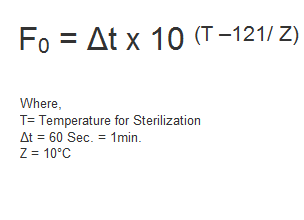 Time of sterilization can be changed (decrease or increase) according to the lethality of the temperature. Δt = 60 Sec. = 1min. It shows that that the thermal lethality of 1 minute at 121 °C is equal to the lethality of 3.98 minutes at 115 °C.